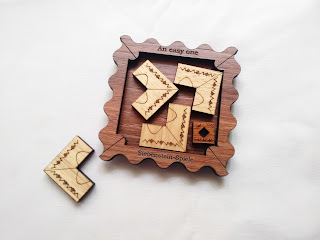 Puzzle Boxes and Trick Puzzles are some of the most fascinating objects you can encounter as a puzzle solver. These puzzles have a secret that needs to be discovered, and it's up to you to find out how they work. One of these intriguing objects is called Euro Falle 01 (translated as Euro Trap), and it's designed by the German Jürgen Reiche and produced by Siebenstein-Spiele. As the name indicates, this is the first in a series of puzzles that has at least six different versions, each one sporting a different design and opening secret. 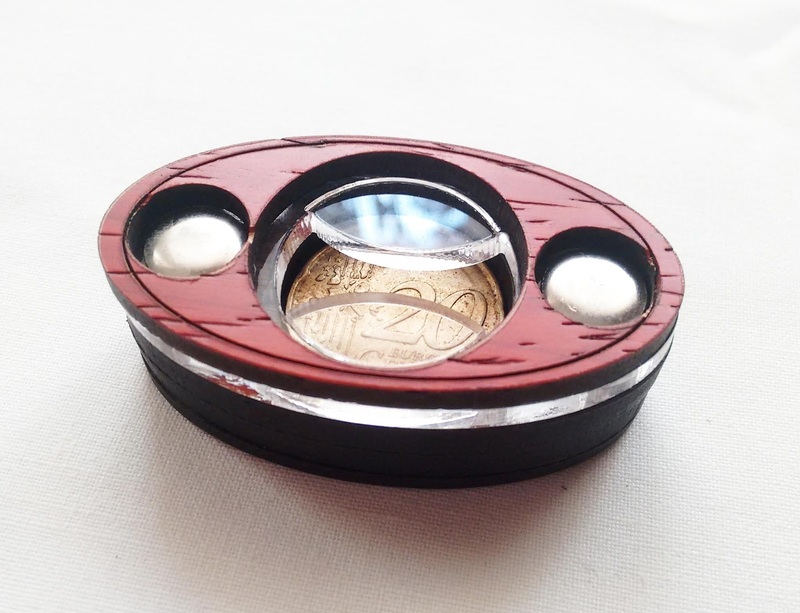 The goal, as you can guess, is to free the 20c Euro coin from the trap. There's also another 1c coin on the back of the puzzle, just to make your task a little more fun (and possibly, more complicated). 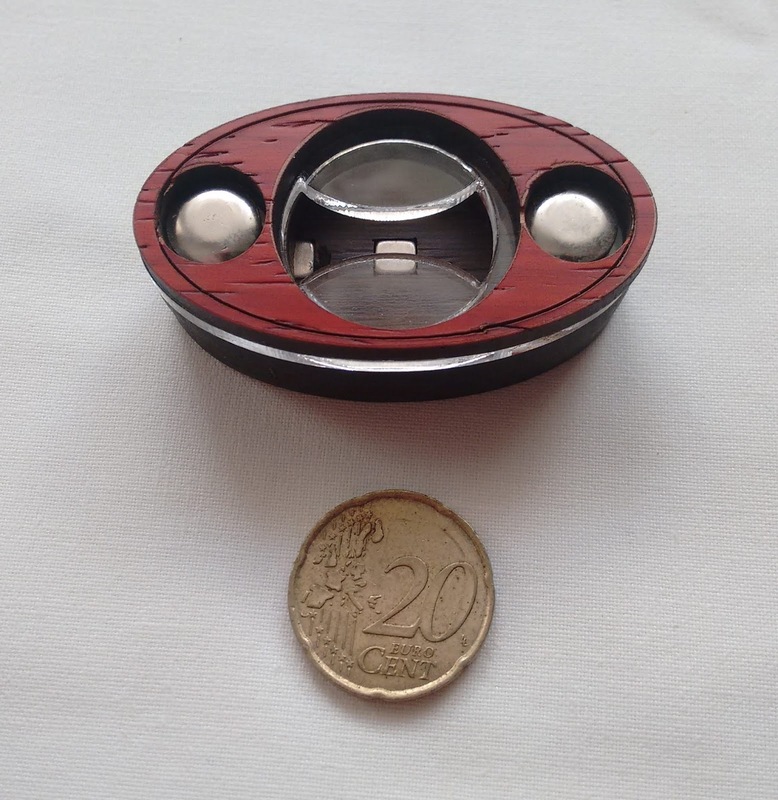 This is a rather tiny puzzle, measuring just 5.3cm x 3cm (2.1" x 1.2"), which fits perfectly in the palm of your hand. Not much space for complex mechanisms, but don't judge it by its size. Rated as a level 7/10, you'll have to put your thinking hat on. Made with a combination of laser-cut wood and acrylic, the puzzle looks gorgeous even at this size. Solving this puzzle is a mixture of past experience with puzzles of this type and a bit of luck/cunning. To be honest, I wasn't anywhere near at solving the puzzle when, purely by accident, I found the main mechanism that keeps everything locked. In all fairness, I wouldn't have discovered it if I wasn't so persistent at inspecting the puzzle from all angles, so the luck part played just a small role in the solving process. It was a nice Eureka moment, when I saw how to free the coin, which is what these puzzles are all about. 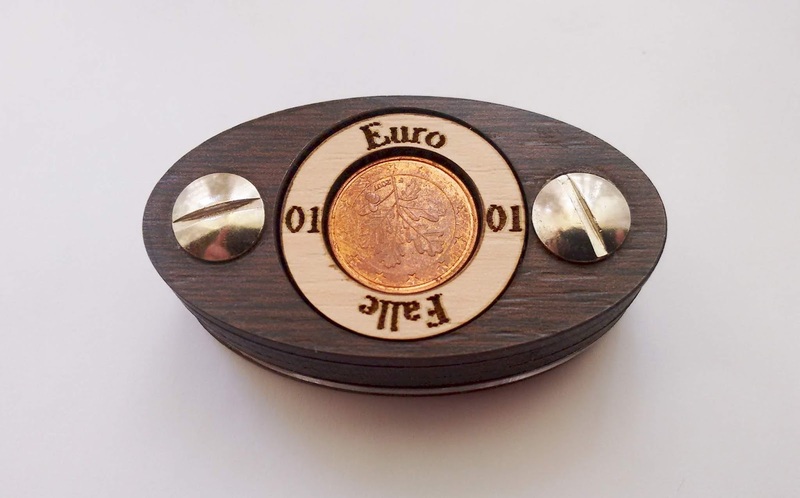 Euro Falle 01 is a great puzzle that can be solved by anyone with a curious mind. It also keeps me interested to explore the others in this series and to try and solve them. Not bad for a small puzzle. Availability: The Euro Falle 01 puzzle can be found at PuzzleMaster for just $16.99 CAD. There are also many others by Siebenstein-Spiele to discover. 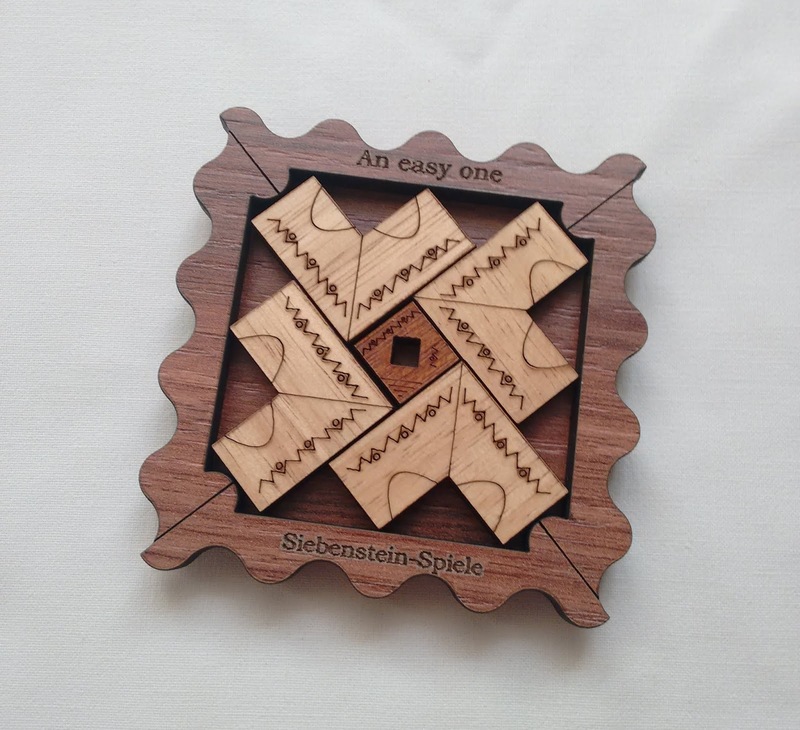 Designed by the German Jürgen Reiche, An Easy One is a great packing puzzle to test your solving skils, or just to keep your brain in good shape. Similar in concept to the classic Four T's, which has had countless versions over the years (here's one), An Easy One by Siebenstein-Spiele has a different approach, but if you solved the Four T's you can easily solve this one. With a diameter of 7.8cm (3.1"), the puzzle is rather small, which is perfect if you want to take it with you on your travels, or show it to some friends to torture them. There are five pieces, four identical L-shaped ones and a small square. The idea is to fit all four pieces plus the square inside the frame. As mentioned above, if you have experience with this kind of puzzles, you already know how the solution should look like. Accomplishing this won't be difficult, but the final pattern is always nice to see when you finally put it all together. This is rated as a level 7/10, but I think in all fairness, it's not that difficult. This turned out to be "An Easy One", after all. Well, maybe for a seasoned puzzler. But if you are new to packing puzzles, don't dismiss it. I really like this type of puzzles, even if it's just to add them to my never-ending collection. Availability: You can find this "Easy One" at PuzzleMaster for just $14.99 CAD. You can also browse many others by Siebenstein-Spiele.